The city of Alton, and the entire Riverbend Region, is a place of history, mystery and lore. There are so many ghost stories here that Alton has been referred to as "one of the most haunted small towns in America". Among the countless buildings that are rumored to be home to ghosts and haunts is the former Mineral Springs Hotel, located in Alton's old downtown. There are many spirited tales connected to this building but unfortunately, it is also a place where fiction mixes extensively with fact. There is a lot of confusion as to the true story behind the hauntings at the Mineral Springs. Over the years, psychic revelations have been accepted as genuine history and these visions have created tales that have little to do with reality. Because of this, the stories that have been told have little, or nothing, to do with the true story of the place. But that's not to say that the Mineral Springs is not haunted - far from it. This old hotel is a place where remnants of the past linger into the present in more ways than one. Even though no guests have stayed the night in the rooms in decades, you can almost expect to see them strolling through the former lobby. Many traces of the hotel still remain, including guest rooms that now house shops and restaurants, the once exquisite tile floors and even the hotel's original safe, which still boasts the lingering aroma of tobacco from the cigars stored here by the Mineral Springs tobacco shop. As mentioned, a visitor really does expect to see guests in period clothing walking up and down the corridors or lingering in the hotel bar..... And, according to some, they still do. The Mineral Springs Hotel opened in 1914 and it was the most spectacular hotel in the Riverbend Region. Early advertising boasted that the hotel featured the "largest swimming pool in Illinois", mineral spring "cures", and the biggest table in the city of Alton, said to seat 26 people. The city had never seen anything like this place but it was no surprise that it had been created by two of wealthiest and most powerful men in Alton. The hotel was constructed by August and Herman Luer, successful meat packers, who intended to open an ice storage plant on the property in 1909. August Luer was a German immigrant who had started a meat packing plant in Alton in 1881. When he had first come to this country, he had lived in St. Louis with his brother, who was a butcher. Concerned about the health of his young wife, Luer set up his own shop in Alton, where he found clean air and the opportunity for new business. Herman joined him here in 1893. The Luer's soon began promoting their product around the countryside and posted daily prices for hogs on the corner of their receiving station. That way, farmers could drive by and stop if they liked the price, or go on to East St. Louis if they didn't. The chili, hams and sausages produced by the Luer's became Alton favorites. They also went on to found the Alton Banking & Trust. The hotel site dated back to the 1880s, when it was a meat packing company, but in 1910, workmen began drilling a well for an ice-making and cold storage facility and discovered a natural spring under the ground. The water from the spring had a strong smell (it turned out to be high in sulfur content) and legend had it that he declared it to have "medicinal qualities". He is said to have recommend that the Luer brothers build a health spa on the site instead of a building for storing ice. Construction was started in October 1913 with the building of a water bottling plant in what became the lowest sub-basement of the building, which was about five levels below the street. The hotel was literally built on top of it, layer by layer, opening for business the following June. The finished structure was in an Italian Villa style, covered in beige stucco with a tile roof. The ornate interior contained terrazzo floors, marble staircases, decorated plaster cornices and art glass throughout. It was elaborate and luxurious and an immediate success, especially after the two mineral pools opened on the lower levels. One of the pools was strictly for men but the other pool was open to all guests and a number of receptions and parties were held there. This large pool became the biggest draw for the hotel and the water was said to have caused "remarkable cures" for all sorts of ailments. Water was pumped into the pool from the spring and it became a popular place for swimming lessons, water polo clubs and for those seeking the healing powers of the mineral waters. A man named "Doc" Furlong also organized hydrotherapy baths and while his methods may have been questionable, the guests and customers went away pleased. Thanks to some savvy advertising, water from the Mineral Springs was soon being shipped to customers as far away as Memphis and New Orleans. In July 1914, the hotel was bottling and selling more than 100 bottles every day. Consumption of the water increased that year to 350 gallons weekly and the hotel boasted that its curative power equaled that of water found in Hot Springs, Arkansas. The mineral water was extolled as a cure for headaches, colds, muscle aches and even as a cure for alcoholism. A newspaper article from 1914 quoted one believer: "I know for a fact that a drink or two of it will, in the course of an hour or two, completely sober the drunkest man you ever saw." People began pouring into Alton to partake of the healing waters and the hotel held its grand opening in September 1914. It was said that at one point, the swimming pool attracted over 3,000 people in a season. 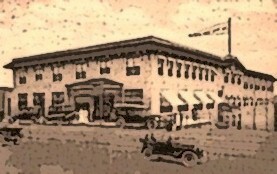 The hotel enjoyed its heyday throughout the late 1910s and the early 1920s. In 1918, Hollywood actress Marie Dressler spoke at the hotel on behalf of the Liberty Loan committee. A number of new rooms were added to the hotel in 1925, the same year that an orchestra was hired to play on Sunday afternoons and for dining in the evening. August Luer sold the hotel in 1926 but it continued to thrive for many years afterward, finally beginning to deteriorate in the 1960s. Tourists and health fanatics stopped coming and rooms that were once used for overnight guests began to be rented to transients on a weekly and even a monthly basis. In 1971, the Mineral Springs finally closed down for good and the place was actually condemned because of general deterioration. The roof leaked in many spots and the ceiling had collapsed in others. In 1978, though, it was restored by Roger Schubert, who developed the building as an antique mall featuring shops, offices and restaurants. During the heyday of the Alton Antique District, it offered a variety of different stores, a Chinese restaurant and another eatery that also offered entertainment. As time passed however, and the district slipped into a decline, the Mineral Springs once again began to slip away. A few years later, however, it began to see life again. This was thanks to further renovations by Bob Love, who bought the building and ran his real estate company from an office in the back for a number of years. Once the hotel re-opened again in the late 1970s, now as an antique mall, stories started to be told about the place. Only these tales had nothing to do with "miracle cures" and the golden days of the hotel - these stories had to do with murder and ghosts. The Mineral Springs Hotel began to be regarded as a very haunted place. The legends of the place claim there are several different ghosts that haunt the corridors and rooms of the Mineral Springs. The first is said to be that of an itinerant artist who was unable to pay his hotel bill back in 1932. His ghost apparently haunts the former hotel bar. This section of the building has served as a shop in recent years but the saloon that once existed here was decorated with fine woods and marble, ornate trim and gargoyle-like figures on the crossbeams. All traces of the bar have since vanished and all that remains behind is the supposedly unfinished mural of the city of Alton that has been painted on one wall. The stories say that the artist who lived here was allowed to paint the mural in exchange for his bill. He died before he was able to finish it and his ghost has remained here ever since. Unfortunately, there is more "legend" to this story than truth. The mural was indeed painted back in 1932 (and it was finished) and it was restored in 1978. However, there is no record that it was painted by an itinerant artist. This suggestion was actually made by Roger Schubert in a newspaper article that was written about the re-opening of the building. The "ghost story" was picked up more as a joke than anything else but, once it was told, it took on a life of its own and has been accepted as the truth. The stories say that the artist's ghost lingers here in the bar and gives off the strong smell of alcohol --- although I have never spoken to anyone, or seen any written record, that anyone has ever encountered him. Another place in the building that is rife with more fancy than fact is the old basement swimming pool. At least one of the stories that is so frequently told is nothing more than pure invention. I will concede that this part of the hotel is haunted --- perhaps the most haunted part of the place --- but it has nothing to do with the story that has made the rounds about a man who drowned here during the heyday of the Mineral Springs. According to this story, the man was at a party here with his wife back in the 1920s and during an argument with her, he was accidentally knocked into the pool and he drowned. In the years after, the man was said to be seen standing near the side of the pool, or in other lower parts of the building. His ghost has been described as angry and brooding, but impeccably dressed in black tie and tails. According to the legend, he is waiting here for the return of his wife's spirit so that he can take his revenge on her for his death. It's a great and scary story but it's also not true. There is no record of an event like this ever happening and no real encounters with a man who lurks in the pool area. As with other stories that are sometimes told about spooky places, this is a great example of local "ghostlore". Those who experienced the unexplained here needed an explanation for what happened to them and the "vengeful ghost" was created to provide a reason for their fear. However, that is not to say that ghosts do not linger in this eerie place. I believe that they do. I had the chance to spend the night in the swimming pool a few years ago and maintain that its one of the creepiest places that I have ever visited. During the night, three of us who were present actually heard the sound of hard-soled shoes walking across the floor in the pitch dark chamber. When we turned on a light, we discovered that no one else was in the room. We were unable to explain what we heard and based on this account, and those that follow, this is a very haunted spot. It's possible that several ghosts linger here and if they do, it's not surprising. For years, ghost hunters have theorized that spirits seem to be attracted to water, especially places where underground water sources exist --- like at the Mineral Springs. It's possible that these phantoms are attracted to the water here and that guests from the past checked into the hotel but their spirits never checked out! In 2002, a very reliable witness, who worked at the Mineral Springs at the time, told me of his own strange encounter with the swimming pool. One evening, he happened to be in the basement area and heard the sounds of water coming from behind the locked door of the room where the pool was located. Since there had not been water in the pool for years, he became alarmed, thinking that perhaps a water pipe had broken and was now leaking into the room. He hurried inside and turned on the lights to see that the floor was perfectly dry! There was no water running and, in fact, the sounds that he heard had stopped. Puzzled, he started to leave the room and as he did so, noticed something odd on the floor. He looked closer and was shocked when he realized what he was looking at ---- a line of wet footprints that led from the edge of the pool and then vanished several feet away! No one had been in the room and there was no water in the pool, so where had the footprints come from? He didn't know, but he was not sticking around to find out. He quickly exited from the pool area and he never came into the room again during the rest of his employment in the building. We also had some strange incidents that occurred during our Alton Hauntings ghost tours around this same time. One night, a friend of mine, who was a police officer in St. Louis, came along to assist me with a large tour group that we had. One of our last stops was in the basement of the Mineral Springs and as we were getting the group together to leave, he later told me that he noticed a man who veered off from the group and started walking away down a side corridor. He followed what he assumed was a guest, to bring him back to the group, for some distance and then around a corner. When my friend walked around the same corner, he discovered that the man was gone! Whoever this person had been, he had simply vanished. 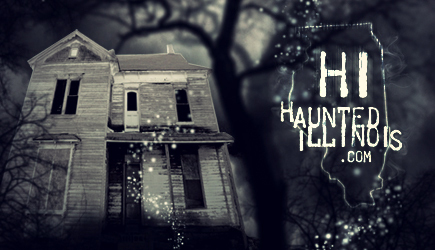 In 2003, another incident occurred during an Alton Hauntings Tour and was experienced by several witnesses at the same time. We were again in the swimming pool area and I was recounting my experience with the ghostly footsteps that I had heard and was doing so with the entire tour group standing in complete darkness. At one point, I turned on a flashlight for a moment and then turned it off again. A few minutes later, we turned on the lights and several people came up to me and reported that during the moment that I switched on the flashlight, they saw a man standing at the edge of the pool --- a man who was not there when the lights were turned on again. They described the man, and even looked for him, but there was no one fitting his description in the group. The stories vary as to whether the woman may have tripped on the stairs or whether her angry spouse pushed her down the staircase. In the end, it didn't matter, because somehow she fell and broke her neck and she was instantly killed. Her despondent husband then returned to their upstairs room and committed suicide. Once again, however, history does not bear out the truth of this story. The only inkling that something resembling this occurred was in 1925, when a female guest did fall to her death on this staircase. It was ruled an accident, there was no evidence of foul play involved, and her husband certainly did not return to their room and take his own life. One might wonder how a story of adultery, possible murder and suicide could grow out of this incident but once more, it's a case of people seeking an explanation for things that they cannot explain. Whatever the cause of the haunting, it seems very likely that a ghost does linger on and around this staircase. Over the years when the hotel was still operating, staff members and guests caught glimpses of a woman's tragic fall down the stairs as her apparition replayed the terrible event over and over again. Stranger still, they also caught whiffs of a pungent perfume, a jasmine scent, on and near the staircase. Even people like former building owner Bob Love, who firmly stated that he was not a believer in ghosts, puzzled over the coming and going of this strong odor. I first spoke with him in 1998 and while he admitted that he did not believe in the existence of ghosts, could never explain one odd happening that had taken place in the building. He explained: "One morning I walked into the building and I smelled a strong, almost putrid, jasmine scent. It was strange." At the time, he had no idea that the strange scent was supposed to be connected to the resident ghost. He later inquired about the pungent odor and was told the tragic tale by one of the building's tenants. He still did not admit to any belief in the supernatural but was never able to come up with an explanation for what he experienced that morning. And employees of the place have not been the only ones to have unsettling encounters with the Jasmine Lady. One woman approached me about her own incident at the former hotel. She was shopping one day when she passed the staircase. She told me: "I had no idea the place was supposed to be haunted. I wouldn't find out until later that everybody seemed to know about the ghosts but me." As she passed the bottom of the stairway, she caught a sickening, flowery scent but had no idea that it might signal the presence of a ghost. What happened next, though, shocked her. She recalled: "Just after I smelled the perfume, I felt this cold chill, almost like a breeze blowing. It didn't just hit me, it, well, I guess sort of brushed past me, but it was real cold. Then, I looked up. There are these signs that hang out in front of some of the stores down the hallway --- and all of the ones close to me start swinging back and forth. That was enough shopping for me that day. I just left after that. I have been back there since and nothing else has happened, but I'll never forget that." The witness that I spoke with was not the only one to have an experience of this sort either. I spoke to a former tenant of the building in late 2002 who told me of a similar incident in the old hotel. He had come in early one morning, about 6:30 a.m., and was not surprised to find the place quiet and empty at such an hour. He came in through the main entrance off Broadway and as he was walking through what was once the hotel lobby, heading toward the main staircase, he felt an inexplicable cold wind push hard against his back. Startled, he spun around to see if someone had opened the door to the street, perhaps letting in a breeze from outside. However, when he looked, he saw that no one was there. Just then, he heard a jangling sound off to his right. He looked over and saw that a wind chime that was hanging in one of the shops had also been affected by this mysterious current of air and it began to ring. The movement of the chime lasted for only a few seconds and then it stopped. It did not gently fade and then come to a stop as a wind chime normally would, however --- it froze in place, as if an invisible hand had reached up and took hold of it. He remembered: "I knew there was something not right about that and it became very clear to me just how alone in the building I was. I decided that it would be a good day to go and have some breakfast and to come back after some other people had arrived." These are only a sampling of the hauntings of the Mineral Springs and it's likely that these ghosts do not walk these corridors alone. Hotels are notorious for the ghosts that have been left behind. Imagine, if you will, just how many people pass through a hotel in a single year. Then, recall how many guests an old hotel might boast after decades in operation. It's not hard to imagine that there might be a ghost or two around --- or perhaps a regular infestation in some instances! The Mineral Springs seems to be no exception to this rule. It's a strange and mysterious location and one that has earned a place of honor in the chronicle of history and hauntings in the Riverbend Region.